Administrator Welcome to the support forum for RC-WinTrans software products! This forum is dedicated to answering questions and discussing issues related to the use of the RC-WinTrans software and components. Before starting a new topic with your question, please make sure the information you seek is not already contained in one of the several online help systems provided by Schaudin.com on our Website (www.schaudin.com). Using the forum's search function to find an answer posted previously or a related topic prior to posting your question is also recommended. To ask a new question, use the "new topic" link near the top of the "RC-WinTrans Support" overview page. If your question relates to an existing topic, or if you simply have something to add, click on the "add reply" link in that topic to post your message there. You can edit or delete your own posts at any time using the "edit" and "delete" links located at the bottom of the post (see image below). Schaudin.com reserves the right to delete any post or thread that is deemed off-topic or inappropriate for the purpose of this forum. Administrator RC-WinTrans 9.1 crashes when using the command line tool or when starting RC-WinTrans via the COM automation interface. Administrator Windows 7: Failure to create the RC-WinTrans application object and run the command line. The RC-WinTrans (X8 or 9) application COM object cannot be created on Windows 7 and the command line tool ("rwtcmd.exe") cannot start RC-WinTrans to execute a command. The RC-WinTrans application (COM object) and RC-WinTrans type library are not registered in the Windows 7 registry. The registration fails while installing RC-WinTrans (setup). No installation error is reported. 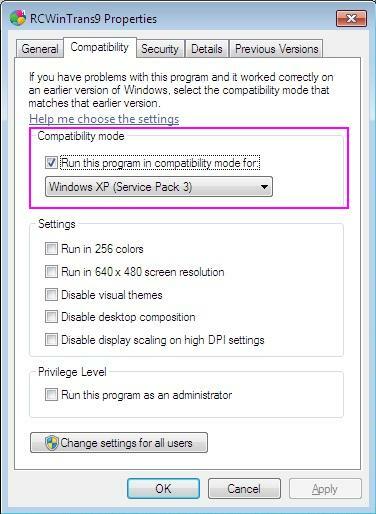 The Windows compatibility mode "XP-mode" must be set for the RC-WinTrans executable file (.exe) and this file must be registered once again. - Set the compatibility mode "XP-mode" for the RC-WinTrans executable (.exe) file ("RCWinTrans9.exe" or "RWTX8.exe"). 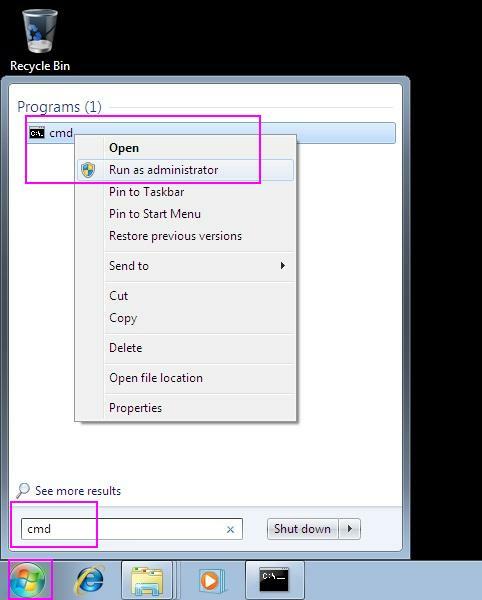 - Start the Windows cmd (DOS prompt box) using "Run as administrator". 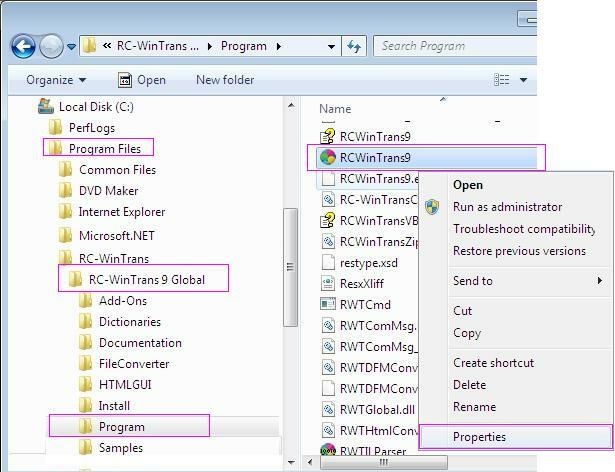 - Run the command "rcwintrans9.exe /register"
The CheckReg.exe tool can be used to check if the RC-WinTrans application and the RC-WinTrans type library is registered in the Windows registry. Note: Only the RC-WinTrans Global Edition will be registered for COM automation. The Translator and Demo Editions will not be registered. this is a known problem. During the installation of RC-WinTrans on Windows 7 the RC-WinTrans application object is not successfully added to the Windows 7 registry. Our knowledge of this error message indicates that the database is corrupt and cannot be fixed. We would have tried using the Access "Repair" function, as you have already done. If you want, you can zip the database file and send it to support@schaudin.com for a check. However I'm not very optimistic that the database can be repaired. 1. How can I choose this language at program startup? This is the same as your code I think. You can test switching the language of your application by using the small LocTester application. When using LocTester you do not need to implement setting the language with "CurrentUICulture". > How can I now integrate these files into my app? It is not possible to add localized versions of an XAML file to a Visual Studio project like you can with RESX files. We would also like to have the option of working with translated XAML files directly but unfortunately it can't be done. > BTW: I already took a look at the samples in WPFProjects folder. It's not possible to build these projects, because of missing files. These are not sample projects. They are two Visual Studio projects used by RC-WinTrans to create a binary BAML file from an XAML file. The XAML elements in your WPF software project (Visual Studio) must have "x:Uid" attributes to be localizable. RC-WinTrans can read (and translate) the WPF resources without having the "x:Uid" attributes but the WPF resources in the target satellite DLL (created by RC-WinTrans) will keep the source text if no "x:Uid" attributes exists. You can use RC-WinTrans to prepare a Visual Studio WPF project (the XAML files) with the required "x:Uid" attributes. Use: "Tools" | "WPF" | ".NET Project update "x:Uid" attributes..."
Select your Visual Studio project file (e.g. for C#: .csproj). Then rebuild your WPF project to create the assembly (EXE or DLL) newly. > I now found a problem, which maybe a bug in RCWinTrans. No, not a bug. This is correct. When using the <UICulture> in the project file (.csproj) Visual Studio builds a satellite DLL and puts the resources into it. The application assembly no longer contains the resources. When using a satellite DLL for the default resources you must translate this satellite DLL with RC-WinTrans- not the EXE. My suggestion: leave the default resource in the EXE. Do not use the <UICulture>. See also (at Microsoft): "Localize a WPF Application"
> "Tools" | "WPF" | ".NET Project update "x:Uid" attributes..."
Nothing happens in RC-WinTrans but for your Visual Studio project. RC-WinTrans call the msbuild.exe (Microsoft command line tool) to add the "x:Uid" attributes to your VS project's source XAML files. Check the XAML files -- the elements should have "x:Uid" attribute now. See at Microsoft: "Best Practice for WPF Localization"
Administrator RC-WinTrans writes the output from the msbuild.exe tool to the RC-WinTrans Output window. Build started 3/4/2011 9:46:44 AM. Project "U:\Test\WPFAppl.csproj" on node 1 (updateuid target(s)). Uids updated in 2 files. Done Building Project "U:\Test\WPFAppl.csproj" (updateuid target(s)). See also (at Microsoft): "Best Practices for WPF Localization"
Administrator Yes. You are right. We've already done this for the next RC-WinTrans 9 update (end of March 2011). the reason may be that the translator has been given the project definition file (.rwtproject) and not the database file (.fsmdb). Did you send him the .fsmdb database file? The .fsmdb file is the only file your translator needs. Administrator We cannot reproduce a problem using German umlauts in the path or in the file name. I think there was such a problem (a bug) for the target language with the language code "zh-CHS." I still do not know the details. Try it with other target languages and see if it works. The operation was designed with the requirement that the Excel spreadsheet contains the same source language as the source language in the RC-WinTrans translation project. Checking this with your sample, I found it works when the Excel sheet contains Russian (ru) and Spanish (es) but not the English (en) source language. I was able to make it work using a trick in the Export Assistant. I will post a description of it here shortly for you to verify. FYI: We already have plans to remake the import/export function for Excel by the end of this year. I think it is a good idea to eliminate the source language requirement- maybe just one (target) language and the resource names (IDs). Administrator This is how the RC-WinTrans data update module is specified and made to work. The data update module identifies a control by its item ID and also by the item's parent control(s). When the control has a new parent control it is taken as a new control and the existing translation for this control gets lost. Administrator Yes. We've verified this. A German umlaut in the path name causes this error when the Windows system uses a code page other than Western code page 1252. Administrator Thank you rboutilier for reporting this. We've fixed it so that the project name will be quoted -- it works now. The fix will be included in the build version following "9.1.0.993 March 2011". This is correct. The WPF Editor uses the Microsoft VSTA 2.0 environment which only supports .NET up to .NET 3.5. Note: WPF windows from .NET 4.0 assemblies can also be displayed and edited as long as the WPF window does not use a component/control which only supports .NET 4.0. We still do not know when Microsoft VSTA support for .NET 4.0 will become available. However we are already in the process of improving the WPF Editor so that Visual Studio 2010 can be used alternatively. The VSTA is included with the RC-WinTrans WPF GUI Editor whereas the Visual Studio 2010 would need to be available on your system. > Assembly 'RWTWPFProj' was not found. Verify that you are not missing an assembly reference. > This error seems to occur for each namespace declaration that is mapped to the current assembly. Right. The reason is that the "clr-namespace" is included in the XAML file given to the WPF Editor. To fix this we will send you an updated "BamlConv.dll" file (file version: 1.2.4.0) by e-mail. Replace the DLL in your RC-WinTrans installation. You will need to run the "Update Database" command for the project or remove your assembly from the project and add it in again. Administrator Yes, we've intended the max. number of visible language is 10. There was no real technical reason. It is a (fixed) definition in our code. Administrator Thank you Steve for reporting this. It is fixed now. The fix will be included in the build version following "9.1.0.993 March 2011". Administrator Yes. We've increased the maximum number of visible languages to 25.